Can I use the design tool on my tablet? Can I use the design tool on my phone? Do I have to download the design tool? Is the design tool compatible with all browsers? How do I claim the discount on my kitchen? Can I print my final floor plan? Do I need my kitchen measurements? How do I change the size of the room? Can I add windows to my kitchen? Can I add doors to my kitchen? How long does it take to get a design and price for my kitchen? Can I change my design at a later date? Can I get a quote if I design my kitchen using a Purely or Uniquely Magnet kitchen? How do I share my finished kitchen with my local showroom? What happens once I’ve finished my kitchen design? Who will be in touch with me to confirm my meeting in-store? What is a Technical Check? Can I create multiple designs? Can I print off the items I choose for my kitchen? Where do I access my saved designs? Yes, however there are limitations when using the design tool on a tablet. We recommend using a desktop browser to get the best experience possible. Yes, however there are limitations when using the design tool on a mobile. We recommend using a desktop browser to get the best experience possible. You may be prompted to install a 3D player to view your final design. This should take no more than a couple of minutes to complete. The design tool is compatible with Chrome, Internet Explorer, Mozilla FireFox and IOS. Once you have shared your design with a store and booked a Technical Design Check you will qualify for your minimum 10% Self-Design discount. This will be applied in store at your appointment when you meet with a Designer. Yes. Once you have your final design simply click print and select the items you would like to print from the list displayed. It’s helpful to have your measurementswhen starting a design to make your plan as accurate as possible. If you’re unsure, watch our quick video to help you plan your kitchen space accurately; this can be found within in the tool at the ‘Measure’ stage. You can change the size of your room by entering your specific measurements or by clicking and dragging the walls in and out. You can also change the room's basic shape and alter the kitchen layout. Yes, you can add windows to your floor plan at the ‘Measure’ stage of the design tool. All you need to do is select your window style from ‘Windows’ menu. Once you have selected it you can then move it to your desired position and change the size accordingly. Yes, you can add doors to your floor plan at the ‘Measure’ stage by selecting an item from the ‘Doors’ menu. Once selected you can drag and drop it to your desired position and resize it accordingly. By using our quick an easy design tool you can get a design and price for your dream Simply Magnet kitchen in minutes. Yes, you can change your design at any time by logging into your My Magnet account and selecting ‘Designs’. From here select the design you wish to change by clicking ‘Open in Design and Price’. This will take you to the final stage of the design tool where you are able to edit your design. 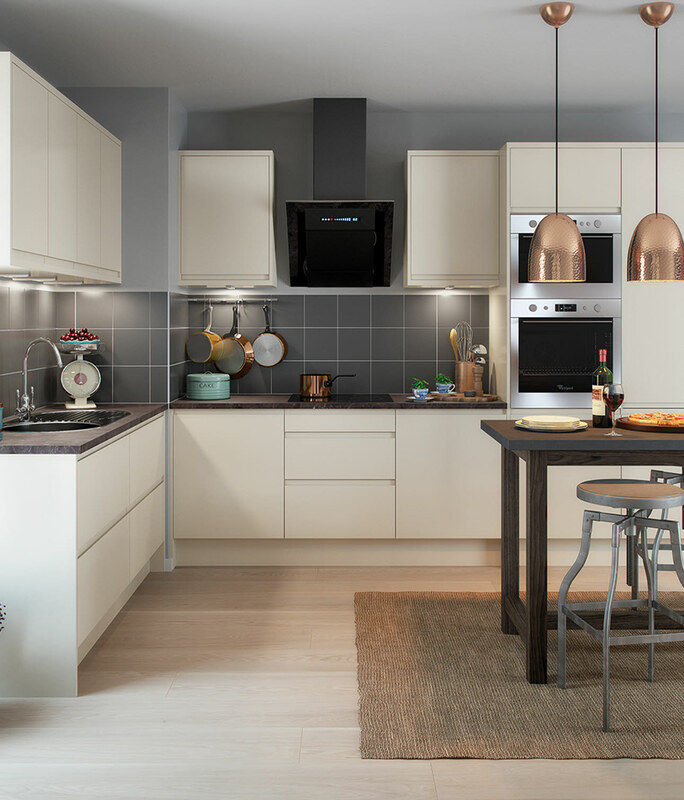 Our Design tool is specific to Simply Magnet kitchens, however you can use our Kitchen Configurator on any Purely or Uniquely kitchen page which will give you an instant price. If you are interested in receiving a more detailed quote please book a Design Appointment to meet with one of our expert Designers who will be able to provide a more accurate quote for your dream kitchen. Once you are happy with your design just click ‘I’m done. Share my design with store to book my Technical Design Check’. Then all you need to do is fill out the form with your contact details, submit to your preferred store and someone will be in touch to confirm your appointment. You can share an existing design by going to My Magnet > Designs and select ‘Book a Design Appointment’. Once you’re happy with your design you can choose to share it with your local store and book your Technical Design Check with one of our expert Designers. Alternatively you can save your design if you wish to come back to it at a later date. A Designer from your selected store will be in touch with you to confirm your in-store Technical Design Check and answer any questions you may have. Once in store you will meet with one of our expert Designers who will technically check your design, they will be able to answer any questions you may have and you will be able to touch and feel product samples. When you are completely happy you can confirm your kitchen order and your 10% Self Design discount will be applied. The Technical Design Check is a simple process where our designers will review your shared design to ensure it meets regulations and that you haven’t missed anything. Installation is not included in the total price shown, however you can view our guide to Installation pricing by selecting ‘See Installation’ or by clicking on the Item List. Yes. You can create as many designs as you like and can access them at any time by logging in to your My Magnet account. Yes, all you need to do is select the print option at the top of the items list. It’s easy to undo the last action, just click the undo button or use the keyboard shortcut Command + Z on Mac or ctrl + z on PC. You will be prompted to save your design at the review stage of the design tool, where you will be asked to log into you My Magnet account. If you do not have an account you can set one up at this point. This is quick and simple process by simply filling out the form shown. Remember to click save after making any changes to your final design to ensure your design is updated. You can log in to your account by clicking on the ‘My Magnet’ link in the top right corner of the website. All of your saved designs will be stored under the ‘Designs’ section of your ‘My Magnet’ account. Not to worry. You can reset your password by clicking the ‘Forgot Password’ link under the ‘My Magnet’ menu.